Restoration is only half the battle, assessment and documentation of damages requires equal attention. As our team is on the ground rebuilding your property, our estimators, insurance experts, scope writers and consultants work behind the scenes preparing all documents required by your insurance carrier. Communication, Documentation, and Justification are the keys to getting an agreed upon scope with your insurance carrier quickly and accurately. Rest assured, Restore-One provides excellence in throughout the entire insurance process just as it provides excellence throughout restoration. 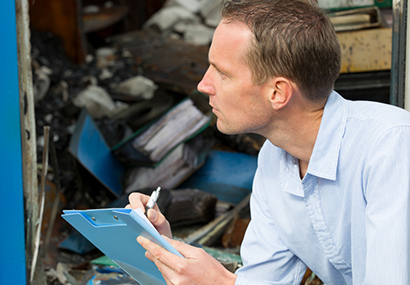 From day one, Restore-One’s team of expert estimators are assessing and documenting damages to your property that will be required from your insurance carrier. Restore-One has worked directly with the nation’s leading insurance carriers, adjusters and building consultants in preparing fair and accurate scope of work estimates after disaster strikes. Our team of professional estimators consists of former adjusters, construction managers, building consultants and insurance executives with decades of extensive training and field experience. Having a broad array of estimating experts gives our customers peace of mind knowing that the scope of work estimate prepared by Restore-One will be thoroughly documented, accurately priced and all within current insurance industry standard guidelines. Constant communication with you is critical. Not only do we walk you through the insurance process, Restore-One also focuses on open and consistent communication with your insurance carrier, adjusters, agents and consultants. This has proven to be invaluable in our ability to produce accurate scope of work estimates that are approved rapidly. Obtain and submit independent certified reports on roofs, mechanical, elevators, building envelope and interior/exterior structures. Obtain and submit contractor bids and proposals for the major components within the reconstruction project. Prepare the reconstruction scope of work estimates utilizing Xactimate software.